2016-02-04 | 964 words | Discussion of steps involved in publishing a Perl 6 modules into the Perl 6 ecosystem. Happy Bit Rot Thursday! This week I'm taking care of fixing minor issues with packaging of my Perl 6 modules, and so, I'll talk about the general process of releasing a Perl 6 module. Let's dive in! Perl 6 is a brand new language, so there's yet no well-established module system like what Perl 5 has, but there is a work in progress. Thus, I'll first describe the process for our temporary GitHub-based system and then I'll talk about the PAUSE-based system that's being worked on. There are some tools and helpers available to help with the process of module development, but they are beyond the scope of this post. So, you want to write a Perl 6 module? If so, awesome! Congratulations on your decision to become a member of the elite, exclusive, limited-time, offer-expires-soon team of about 130 developers who currently own the 549 modules that comprise the Perl 6 Ecosystem. There are plenty of things that need to be written and if you're still having trouble coming up with ideas for something to code, check out the Most Wanted list. You can publish Perl 6 modules as well as scripts (executables). The above shows the possible files and directories your distribution would have. The bin/ directory is for executables, lib/ is for modules, resources/ is for additional resources, such as images or templates, t/ is for tests to be run by the user, and xt/ is for your author tests that are not run as part of the installation process. The documentation can be included in the same file as code in POD6 format, but since the current system uses GitHub, a README.md makes it much easier to read the docs. Also, you are encouraged to enable Travis testing, hence the included .travis.yml file. You can use either a simple config file or a more advanced version written by ugexe. Most important of all is the META6.json file. It's a distribution metafile in JSON format that specifies what stuff your distro provides, as well as its prerequisites and authorship information. You can learn what all the keys are for in S22 Speculation or look at a sample META file. This is a place where many errors happen, so I encourage you to use Test::META that will spot all the common mistakes. Lastly, .gitignore is a file where you can list things for git to ignore and not include in your repo. For a start, you'll want to add single line lib/.precomp into it. This is the directory created by Rakudo to store precompiled files when you run your tests, for example, and you don't need to store it anywhere. 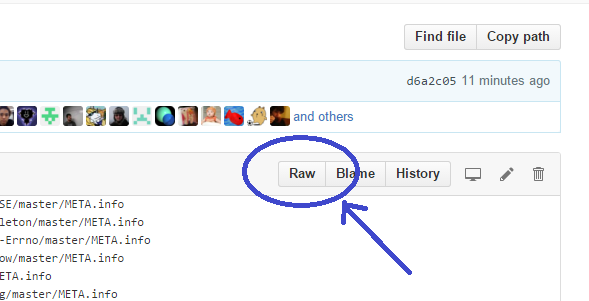 Currently, the authors host their modules as repos on GitHub, so place your files there. It'll require some understanding of how to use git. Go to the META.list file in perl6/ecosystem repo. You can edit that file directly (and submit a PR) by clicking the pencil icon in top, right corner on GitHub, or fork the repo and submit a PR using other means. In that file, on a separate line, add the link to your dist's META file. Keep in mind that panda doesn't fetch a new ecosystem list on each run, so if you want to install your freshly-added module, you need to run panda update first. Perl 5's model goes something like this: you upload stuff on PAUSE, it gets propagated to all sorts of mirrors (CPAN), you can search for things using MetaCPAN, and you install those things from one of the mirrors using a CPAN client, like cpanm. Wouldn't it be sweet for Perl 6 folks to get in on that action? Well, you can! Unless you're reading this after the world was destroyed by a nuclear catastrophe, you can log in onto PAUSE right this second and upload a Perl 6 dist. Providing your dist looks proper and contains META6.json file, all you need to do is choose Perl6 as the Target Directory on the dist upload page. Now, just because you uploaded a Perl 6 dist doesn't mean it'll show up on MetaCPAN; it's the whole point of specifying the Perl6 target dir. There will be a Perl 6 version of the MetaCPAN hosted elsewhere. That MetaCPAN will be a modified version of the Perl 5's MetaCPAN under the hood. Currently, that work is being done by brave pioneers like jdv79, ranguard, and anyone else who I left out due to my ignorance. Having more Volunteers would certainly be helpful, and if you seek fame and recognition, you should stop by #perl6-toolchain channel on irc.Freenode.net and offer a helping hand. Hopefully, you found this article helpful and I await your contributions to the Perl 6 Ecosystem!